The popular 1957 Topps baseball card set is one of the most attractive sets of the 1950's. Many collectors forget that even complete 1957 Topps sets are usually missing something - the checklists. 1957 was one of the last years to include unnumbered checklists separately. 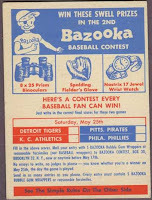 Although the 1958 Topps set did have unnumbered contests cards and felt emblems, they also had team checklists. 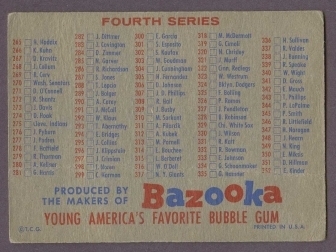 PSA acknowledges that there are very few surviving 1957 Topps checklists, probably because, since they were unnumbered and looked like an advertisement for gum, would have been the first casualties of the 1957. Additionally, they were intended to be used as checklists, so young collectors would have been eager to start marking them up and taking inventory of their collection. 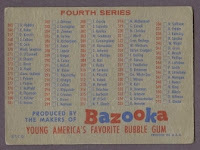 The checklists remind collectors of exactly what baseball cards were still selling in the 1950's - bubble gum. There are advertisements for several different brands of gum. There are two checklists with Blony gum and two for Bazooka, each with a different back. 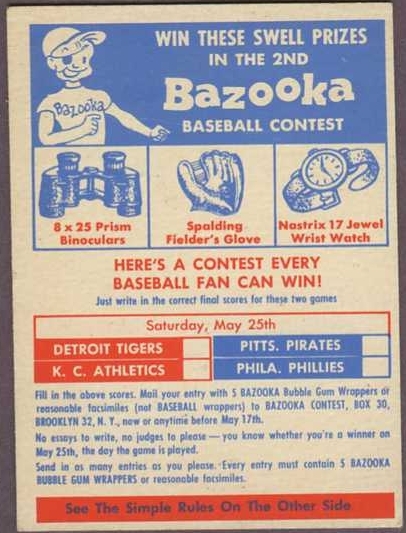 Topps also included three different contests cards that could be identified by the date listed as the deadline for the contest, as well as a lucky penny card that could be redeemed for a penny holder that came with a 1957 penny inside. Right now, we have several different checklists and one of the contest cards in stock. Please click here to see the rest of our 1957 Topps baseball cards.